ST. CLOUD, MINN., JULY 17, 2018 – Supporting the communities they serve is an important part of Marco’s philosophy of giving. They invested in our local community by helping Pathways 4 Youth, a youth opportunity center for homeless youth ages 16 to 23. Marco donated a complete video surveillance system, desktop computers, television displays and a check—all of which totaled $38,000. Pathways 4 Youth is a partnership between the St. Cloud area Rotary Clubs and HOPE 4 Youth, a nonprofit headquartered in Anoka that works with homeless young people in the North Metro suburbs. The four Pathways founders include St. Cloud Rotary members John Bodette, Tim Wensman, Bill Maney and Steve Bresnahan. “Not one person has turned us down when we asked for help,” said Bodette. After presenting the plan at area organizations, talking to contacts and receiving generous support, the team worked tirelessly on the youth opportunity center. Six months of volunteer hours, hard work and generous donations later, Pathways 4 Youth is a tangible place. “Currently, 125 youth a night experience homelessness in the St. Cloud area,” said Wensman. “If four youth are experiencing homelessness, one in four will experience it for the rest of their life.” Throughout the process, Wensman participated in a point-in-time survey to receive accurate data. He interviewed many youth, led focus groups and shadowed outreach workers during visits to homeless camps. Wensman explained that the expense to provide public services for a homeless person is over $600,000 throughout his/her life. At Pathways, the youth can shower, do their laundry, meet with case workers, search for jobs, and receive food, clothing and hygiene supplies. Local doctors, caterers, optometrists and others offer their services at no cost for the youth. “Most of these people we don’t even ask; they just volunteer to do these wonderful things,” said Bodette. In a central space at Pathways, Marco’s donation of three desktops allows youth to research jobs, develop resumes and use the wireless world. “Marco was just great to work with. They provided a lot of specialized skills with the security, the Internet, wiring and voice system,” said Bodette. Bodette said he is really impressed with the cutting-edge surveillance system. From a central monitoring platform, staff can see camera angles all around the building, which increases protection. Marco’s contributions of equipment and services help not only Pathways, but also Youth for Christ and Big Brothers Big Sisters. Located at 203 Cooper Ave. North, Suite 260, Pathways 4 Youth shares a building with area businesses, Big Brothers Big Sisters and Youth for Christ. “Marco provided video surveillance for all three places as a donation. Our relationship with Marco is golden,” Bodette added. Thanks to Marco’s contributions and many others’ philanthropy, Pathways 4 Youth officially opened in May. With more volunteers, they are now open every Tuesday through Thursday from 2 p.m. to 7 p.m., with plans to open every weekday by September. The mission is providing pathways to end youth homelessness. Wensman said their measurement is going to be the number of youth they educate and find jobs for. By connecting youth in the St. Cloud area with education and career employment, they hope to eliminate youth homelessness. “For us to get involved was pretty easy, and I’m glad we did,” said Gau. Marco will continue to aid Pathways 4 Youth by offering free service and support for all devices installed. “I look forward to seeing the kind of results and positive changes we expect to get from the Rotary and from Tim, and it seems to be well on its way,” added Gau. For more information about Marco, please visit marconet.com. For additional information on Pathways 4 Youth, or to sign up as a volunteer, please visit www.pathways4youthmn.org. Donate items from the center’s top needs list using this link. The Marco and Pathways 4 Youth teams gather for a group photo. 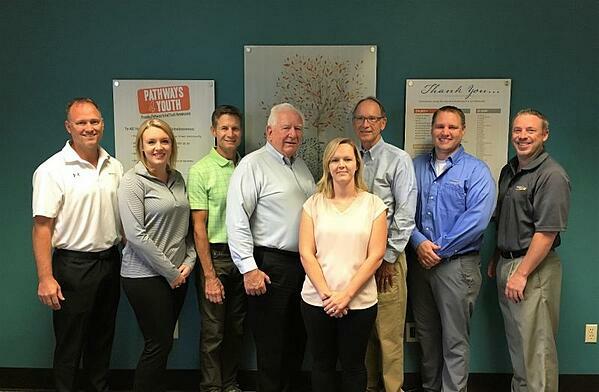 From left to right: Consulting Systems Engineer Marcus Mrozek, Technology Advisor Taylor Kirt, Pathways Founder Tim Wensman, Pathways Founder Bill Maney, Pathways Program Manager Callie Olson, Pathways Founder John Bodette, Consulting Systems Engineer Steve Schulzentenberg and Technology Advisor Jeremy Kirt.